I make my husband proud. Last Friday I was at an event and speaking with a new friend as we made our way through the lunch buffet line. We started chitchatting about studying abroad in college. I said I never did study abroad when I was in college, but I wish I would have. She said that she spent a semester in Spain and loved it. I said my husband studied abroad in Spain and loved it too! She asked where in Spain? 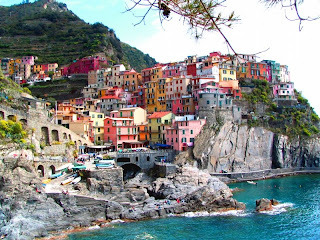 I said Cinque Terre! She said that's in Italy. You are your mother's son.